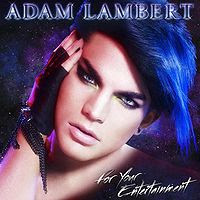 American Idol runner-up Adam Lambert recently released the album cover of "For Your Entertainment." The album cover was controversial for its obvious reasons. Anyway, the album will be on stores on November 23, 2009. In this album, Lambert collaborated with Lady GaGa, Greg Wells, Max Martin, Linda Perry, RedOne, Ryan Tedder, Sam Sparro, Kara DioGuardi and Pink. 3. "Whataya Want from Me"
8. "If I Had You"
15. "Down the Rabbit Hole"
Pre-order Adam Lambert's For Your Entertainment .